Our treatment area is the heart of our practice. In this area, our out-patients and those requiring hospitalization are provided with many services. After the doctor examines the patient and produces a diagnostic and treatment plan, our veterinary technicians put that plan into action. 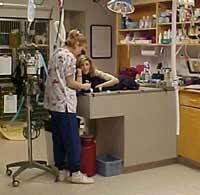 "Vet Techs" draw blood, place intravenous catheters, take x-rays, perform dental cleanings, monitor anesthesia, and assist doctors in medical procedures to name a few. They also provide lots of TLC to your pet during his or her stay. Observation cages in our treatment room provide an easily monitored area for our patients to wake up from anesthesia, and for non-contagious pets to receive care and attention throughout the day. The treatment area is centrally located with easy access to all other areas of the hospital. 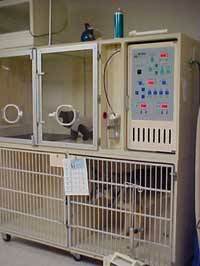 Our special small mammal intensive care unit allows for control of temperature and oxygen levels. It is also centrally located in our treatment area for easy observation. The intensive care unit is also located here. This is for animals that require continuous observation. This unit provides a controlled environment with heated floors, humidity adjustment, and oxygen for our most critical patients. Intravenous pumps are also used for precise administration of IV fluids to our patients.